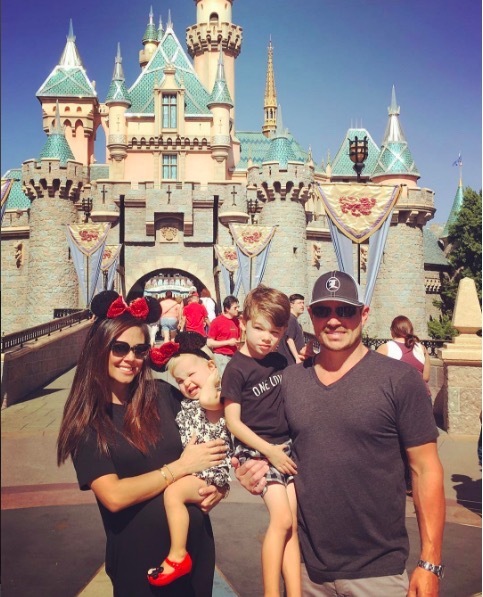 Nick Lachey, his wife Vanessa Minnillo-Lachey and their two children Camden & Brooklyn visited Disneyland Resort in Anaheim, CA on Wednesday (Oct. 21). The singer took to Instagram to share a family portrait in front of the iconic Sleeping Beauty castle. In the shot, Lachey holds their 4-year-old boy, while his pregnant wife holds their 18-month-old daughter on her hip. “I’ve been waiting for years to ride a rollercoaster with my son! Thank You @disneyland for making this happen! #ThunderMountain #Matterhorn #SpaceMountain,” she captioned the shot. Lachey also shared a short clip of him and Camden taking their first rollercoaster ride together. In September, the couple announced they are expecting their third child. Lachey and Minnillo married in 2011.